In the village of Hage, there was a young boy named Asta, who dreamed of one day being the “Wizard King,” the greatest mage in the land. He has one big problem; he can't use magic. When he is 15-years-old, Asta receives the rare “five-leaf-clover grimoire” (a book of magic), which gives him the power of anti-magic. Can Asta become the Wizard King without being able to use magic? He won't give up. As Black Clover, Vol. 2 (Chapters 8 to 16; entitled Those Who Protect) opens, Asta proves that he belongs in the Magic Knights squad known as the “Black Bulls.” He faces the ice-magic user, Heath Grice, who was attacking the village of Saussy with his allies. The Black Bulls next mission is to enter a newly discovered dungeon (like a tomb full of treasure and traps). However, this dungeon is situated on the border between our heroes' Clover Kingdom and the rival Diamond Kingdom. Asta will reunite with a friend, face some powerful Diamond adversaries, and gain a new pal. THE LOWDOWN: Whenever I enter a manga about an orphaned boy with magical powers, a youngster who must also undertake the hero's journey, I think of the Harry Potter novels. [I never think of Harry Potter when I read a magical girl manga.] The Black Clover manga is not a Harry Potter clone, but is a furious battle manga. 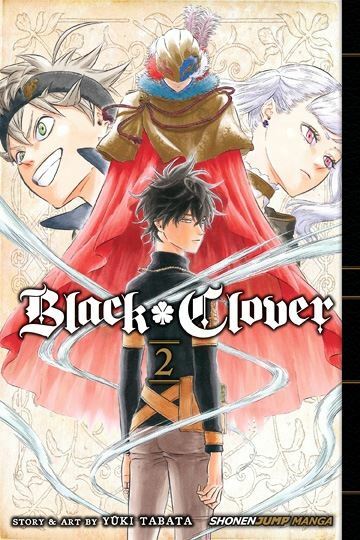 Black Clover Volume 2 is the volume in which the series really starts to show its true identity as narrative. Creator Yuki Tabata is quite imaginative when it comes to casting different versions of similar spells, and he has a menagerie of magic users with which to blow his readers' minds. He has a good lead in Asta, but right now, the tumultuous fights bursting with magic energy are what make Black Clover such an invigorating read. At this point, the series is more Bleach than Harry Potter.